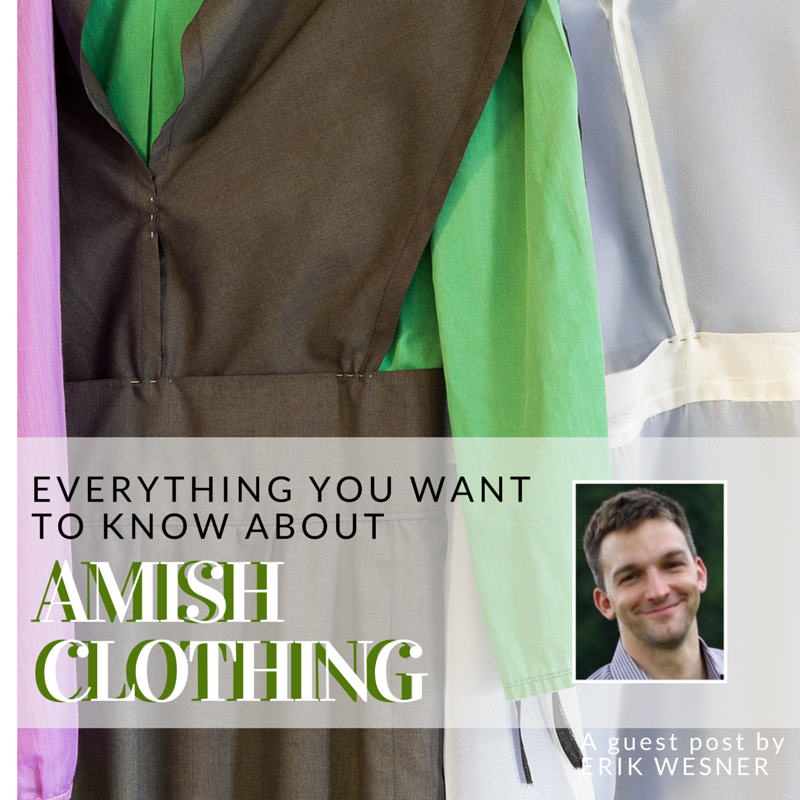 Say hello to Erik Wesner, author of Success Made Simple: An Inside Look at Why Amish Businesses Thrive, as he joins us again to explain a facet of Amish life that most of us English folk find curious: Amish Clothing. 1) Modesty – Amish feel plain dress demonstrates modesty. Plain clothes are not revealing. Women’s dresses are loose and not form-fitting. Men wear long trousers in public in summer as well as winter, rather than shorts. Amish believe that a plain appearance befits a Christian people who emphasize internal virtues over appearance and other superficial external qualities. 2) Biblical basis – The concept of Plain clothing has a Biblical basis, though the specific type of clothing Amish wear is not Biblically-mandated. Amish cite verses including I Peter 3:3, 4 and I Timothy 2:2 in support of wearing Plain clothing. 3) Identity – Think about a time you’ve seen Amish people. You likely knew they were Amish by their appearance. If not for the beards, hair coverings, and plain dresses, they could be a part of any (or no) religious group. Clothing is an important part of Amish identity. 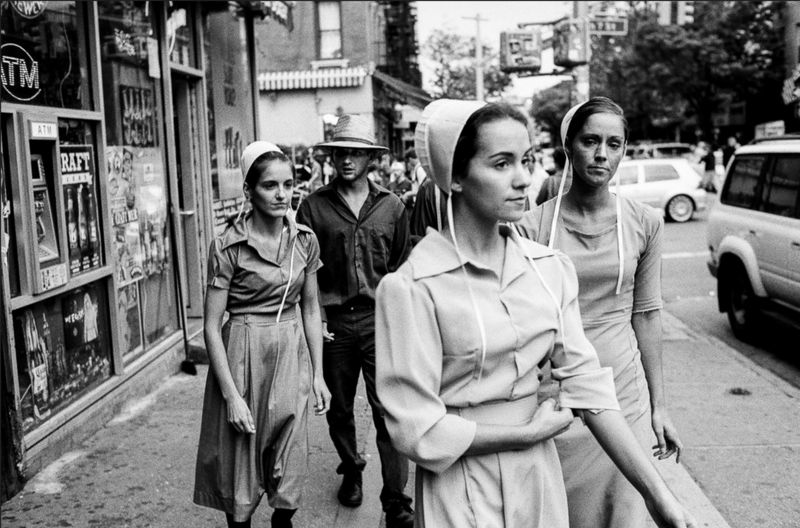 Plain dress marks the Amish as different from the rest of society, “a people apart”. And though it might not be immediately noticeable to outsiders, variations in the clothing of different Amish groups indicate differences between communities. In fact, in some cases it can be possible to get an idea of the individual community an Amish person belongs to by his or her style of dress. Where do Amish get their clothing? Amish get their clothing from a variety of sources. Some apparel will be store bought (for example, from a large chain store such as Wal-Mart) – underwear, socks, and shirts in some cases. 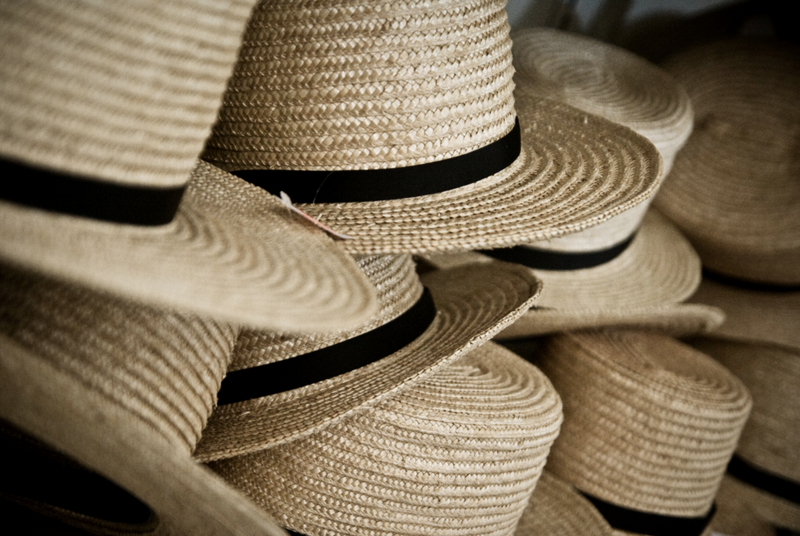 Amish-run variety and dry goods stores often carry plain clothing items, such as socks and hats. 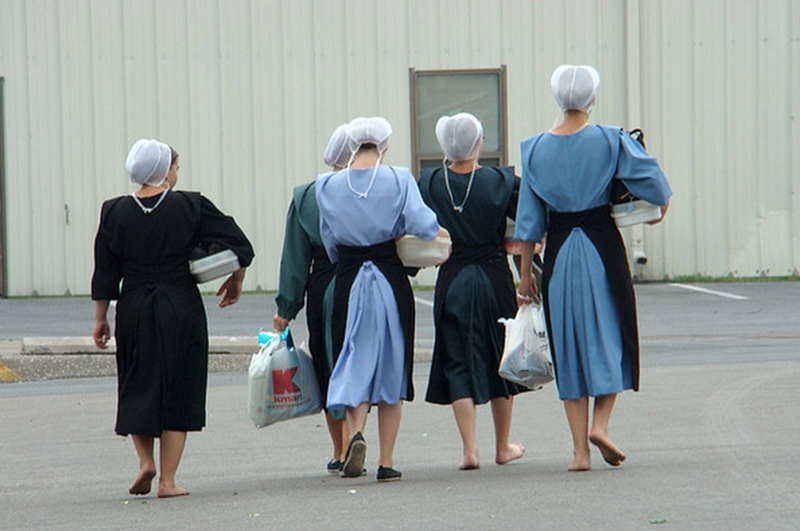 Amish females also make clothing in other cases – for example dresses or broadfall trousers. Some Amish businesses specialize in making clothing like the formal suits Amish wear to church (mutza suits). What are some characteristic items of Amish male clothing? Men wear broadfall trousers, named for the fact that they contain a broad flap which unfastens, in lieu of a zipper fly. Amish men and boys wear plain non-patterned shirts, both long and short-sleeve, in a variety of colors including white, blue and green, as well as brighter hues such as yellow, red, and purple (some Amish youth may also wear shirts with subtle patterns). Men’s trousers are held up in most cases by two suspenders, though men in some areas (such as Holmes County, Ohio) in a certain age range often do not wear them as a part of their daily apparel. Men wear plain work jackets, and may wear a formal, collarless, pocketless mutza suit to church. Amish men wear hats typically made of straw or felt. Men in more traditional communities tend to wear hats with broader brims, as do older males and members of the ministry. The beard, while not technically clothing, is another well-known physical marker of Amish males. Amish have a Biblical basis for wearing the beard, such as that found in Leviticus 19:27, “neither shalt thou mar the corners of the beard.”. Hair styles can vary among the Amish, though more conservative communities typically have longer hair while the more progressive, such as New Order Amish, often trim it fairly short. Footwear varies among Amish men as well, ranging from work boots to formal shoes to more comfortable walking shoes. Amish women typically make their own dresses, buying material from fabric stores in their communities, often Amish-run. Colors range from dark blue and brown to lighter shades such as turquoise and pink (following a relative’s death, an Amish woman will wear a black dress for a certain customary period of time). Some use buttons while others use straight pins to fasten their dresses (this can depend on custom in the community). 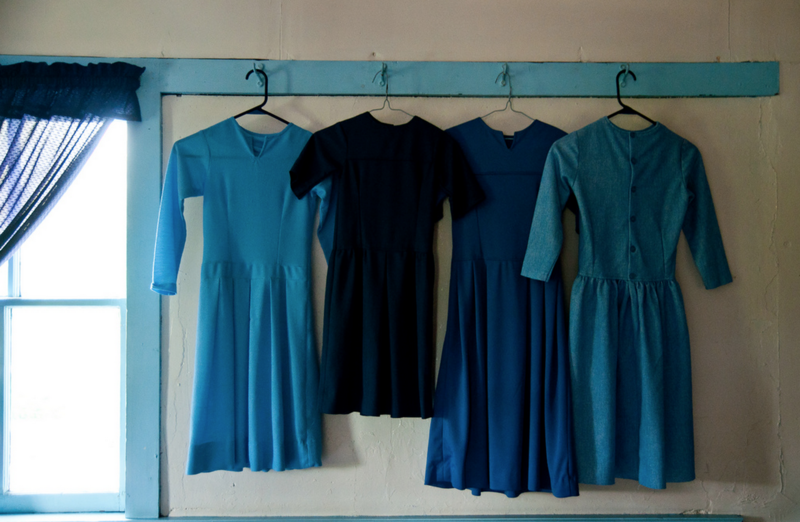 Amish women’s dresses are generally made from generous amounts of fabric so that they don’t emphasize the woman’s figure, and fully or nearly-fully cover legs. 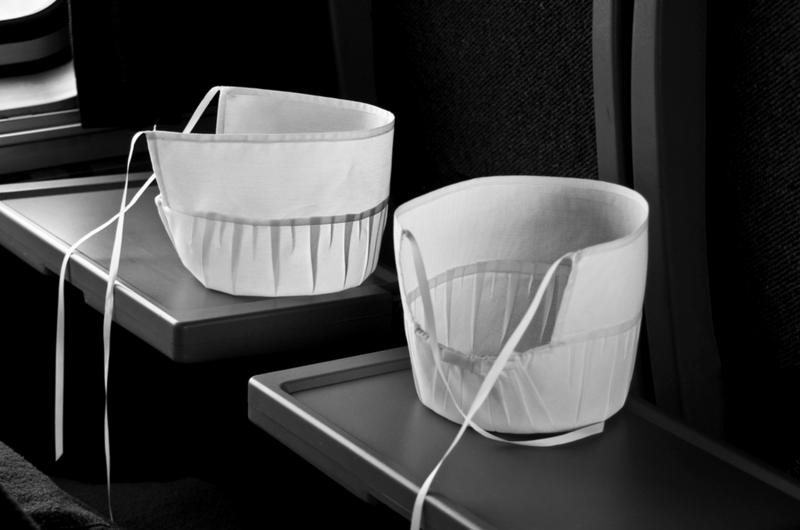 The white or black head covering Amish females wear is known as a kapp or prayer covering. This is different from the larger black bonnet women may wear over the kapp. As far as hair, Amish women generally do not cut their hair, pinning it up in a bun under the prayer covering (citing, for example, passages from 1 Corinthians). Women in some communities wear an apron to church. A large black cape may also be worn when out. Different communities have their own specific customs regarding clothing. For example, in northern Indiana, it is common for men to wear knit caps, a practice less frequently seen in a place like Lancaster County. Another good example is found in the three main Amish groups found in Kishacoquillas Valley in Pennsylvania, who have three different ways of using suspenders—one group wears two, one a single suspender, and another, none at all. The woman’s kapp will vary across settlements as well—from the Lancaster heart-shaped covering to the straight sided, multiple pleat covering found in many Midwestern settlements. Plain clothing marks the Amish as a people apart. It emphasizes modesty, and Amish believe there is Biblical basis for wearing it. Plain clothing has strong symbolic and religious value for the Amish, and is one of the key visual markers of the culture. Clothing is a marker that not only identifies the Amish as different from the rest of the world—but also marks Amish communities as different from one another. By Erik Wesner, author of Success Made Simple: An Inside Look at Why Amish Businesses Thrive, and editor of the Amish America website. 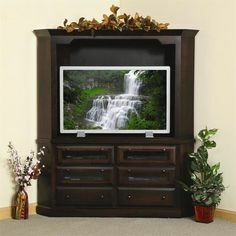 Jayca was the digital marketing coordinator for DutchCrafters. Do Amish men wear their hats in church? Thank you for your question. According to a 2014 article in Ohio’s “The Daily Record,” “Amish men wear hats most of the time; a hat would never be worn in church, and most of the time they would remove it when going indoors as well. Inside doorways at public places like hospitals, one will often see a rack hung with varying sizes of yellow straw hats (whose owners are most likely visiting an Amish patient).” It’s an interesting article about the various headwear worn by Amish men and women that you can read here: https://www.the-daily-record.com/news/20141002/of-brims-and-bonnets. Thanks again for your question and for reading Timber to Table. I love reading fiction books about the Amish. I’ve read several lately. My question is, do Amish women wear bras? Is it true that Amish men start growing their beards when they marry. ie instead of a wedding ring for example, they wear their beard? Thank you for your question. Yes that is true. Amish men will start growing a beard when they marry. They do not wear wedding rings.